On the 8th of April EAP Malaysia was featured, with Jochebed Isaacs, our director, in Berita Harian under the family section. Some people with autism can still live a normal life. Some others are faced with difficulties, challenges and need support specialists continuously. The main challenge with autism include social communication, social interaction, attitude focused on something else, treatment and repetitive interests. Here, who is responsible and plays a role in helping these children terbabat independent and hone their social skills? Certainly parents, but some parenting skills and knowledge less make some engrossed mengesam symptoms from the beginning. 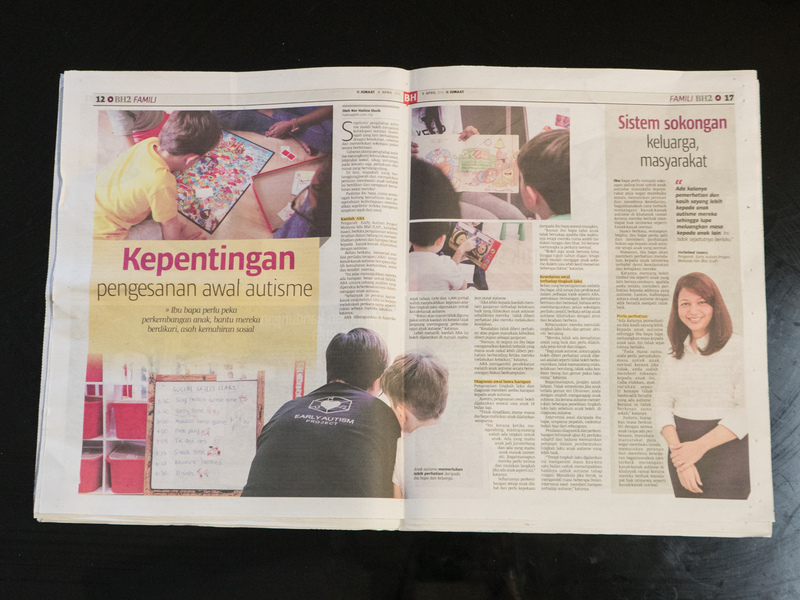 Early Autism Project Director Malaysia Sdn Bhd (EAP), Jochebed Isaacs, said over 10 years experience in this field shows great potential and hope to children born with autism. He said through an applied behavior analysis (ABA) many children with autism are able to be trained communication skills, their social self. “This clearly shows that there is great hope for them to be educated among the branches of ABA certified its effectiveness in teaching children with autism. A total of 50 percent of children who through ABA managed to do the same as their peers do,” he said. ABA developed in the United States since 1970 and 1,000 journals already proved successful analysis of attitudes to children with autism. “Rattan or angry does not apply to this method because it does not directly stimulate the development of children with autism,” he said. More interesting, ABA methods can be carried out in the homework center or even autism. ABA lebig to the method of rewarding the good behavior of children with autism who do not turn their attention if they make a mistake. “Mistakes are not given the attention or praise the advantages given praise as a reward. However, in this country parents operate the reverse of which brat more attention than when they do good,” he said. ABA approach to train children with autism alone is not a group. Behavior detection and diagnosis gives hope to thousands of children with autism. Therefore, early detection can be carried out as early as age 18 months. “Undoubtedly, any parent wants the child is born perfect. This is because during pregnancy, each existing dream of the miserable child. Some want the child to be a pilot and one wants children to enter university. However, they need to receive and initiate measures if there are children like this, “he said. The development of every child should be seen and sensitivity of parents as early as possible. “Many parents know the child is not talking when it came time but they only take action to wait and see. It’s because you think it’s normal. It’s okay to children aged five to seven years to learn, but it is easier to teach children with autism at the age of smaller through several factors , “he said. He is an experienced trained parents, therapists and professionals in a variety of topics such as ABA, trial separation, playing and socializing skills, language and develop a positive behavior support plan, said every child is born with autism types and different circumstances. Most of them have behavior like a rigid and repetitive activities. “They do not have good social skills and be trained. There is a kind of severe and mild. For children with autism, the symptoms can be considered to be detected are not berkominikasi, regardless of currency, the behavior is repeated, do not like the noise and likes to wear clothes the same, “he said. However, do not misunderstand. Not necessarily if the child is too fond of the series Ultraman , you can easily treat children with autism. This is because autism require some research other behavior before a child can be diagnosed with autism. Early intervention from parents, as the saying goes, let the curved bamboo shoots. Diagnostic assessment and development, including IQ tests, adaptive behavior and language play a role in shaping the behavior of children with autism better. “This ongoing behavior therapy takes about a month to show results for the mild autism. Whereas if severe, it takes several months. Early intervention gave hope for autism,” he said. Parents should be the most juat support for children with autism while also reasonable opened the minds of the people, play a role and build awareness, how best to deal with children with autism in a crowd because they are entitled to privileges like normal children. Isaacs said that, even so, parents should pay attention fair and open only to children with autism but a normal child. Usually, parents will give in-depth attention to the special child concerned for the safety and welfare. He said it can issue like the other children feel jealous when you really pay attention to his brother’s autism. Thus, the relationship between children with autism and siblings to be good. “There are times when the observation and affection more so parents forget to leave time to other children. This should not happen. At the same time, you have the time allocation for normal children because if not, you’ve given the strain on the child. Try to avoid, paragraph messengers such as why not aid disbursed siblings have autism because it is not effective at all, “he said. Therefore, spend quality time with all the children without distinction, while society should also open their minds, to play the role of and build awareness of how best to deal with children with autism in a crowd because they are entitled to privileges like normal children.